Almost 10 years ago, I sat down for 2 weeks in Brighton Public Library and put everything I knew about residential solar power systems into my battered old laptop. I used the free Wi-Fi to upload that information to a home-brewed website called SolarQuotes. The knowledge was picked up from working for the Energy Transformed Flagship at CSIRO combined with my broader background in electrical engineering. Since then, millions of people have visited the site; which has been continuously improved over the years. They are skeptical of the benefits. Is solar power really a good investment? They are put off by spending thousands of dollars – and are unaware of low-cost finance options that often give positive cash flow. They are wary about buying a lemon from an industry with hundreds of solar panel brands available. They are worried they may choose a bad installer from the many installation companies vying for their business. Although most of these questions and apprehensions are covered somewhere on the SolarQuotes website, I’ve increasingly sensed the need for a well structured, self-contained package of information that definitively lays out what Australians need to know to buy solar confidently and get their electricity bills down. Ideally in a format that you can curl up with on the couch (or throw at an unsolicited solar-selling doorknocker1). But this time it didn’t take me 2 weeks. It has taken me 2 years2 to sit down and download all the solar information swirling around my head and on my website into a real bookstore book. It’s been quite an experience, and certainly a lot more involved than banging up a blog post. I’ve learned about structural edits, copy edits, typesetting ISBNs and publishing. The enforced discipline of publishing a real book has forced me to think about everything the average person needs to know about solar power and lay it out in a coherent structure that can be easily read without staring at a screen. I’m really happy with the resulting fifty-odd thousand words, 205 pages and 47 illustrations. 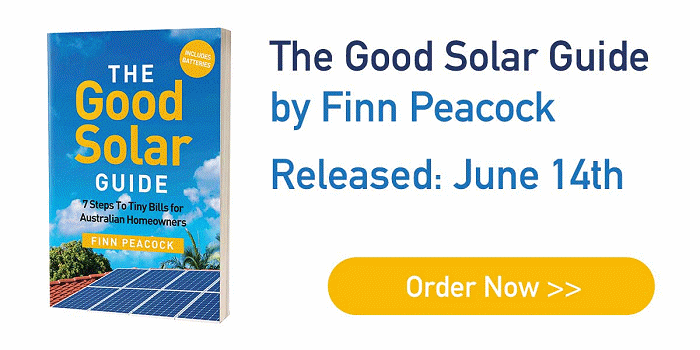 The Good Solar Guide was released on 14th June 2018 and you can order the book here. The book is a step-by-step, paint-by-numbers approach to understanding, specifying and buying a solar power system that will deliver the security of low electricity bills for decades. The book is primarily for homeowners who haven’t yet put solar panels on their roof, but I hope it will also be a valuable read for anyone who wants to understand solar better, whether they are policy wonks, new solar salespeople or simply those who find the transition to rooftop energy generation as fascinating as I do. I'm a Chartered Electrical Engineer, Solar and Energy Efficiency nut, dad, and founder of SolarQuotes.com.au. My last "real job" was working for the CSIRO in their renewable energy division. Re installation : We had a 3.5 kw system installed on our 3-bay shed; the installers didn’t walk on the beams and ruined the roof which has leaked ever since. The business @ the Gold Coast didn’t want to hear about it! Which business did the installation? It was SAE Tweed Heads. The salesman when he came said he was a local, when the installers came, they said they came from the Gold Coast. The inverter they installed lasted about a year. Signed copies for the first 100 pre-orders Finn? To add further panels, I then got three quotes from Solar Quotes, but was told by all three (two of whom actually came round to my house) that as my system was so old there would be compatibility issues and I would need to have almost everything replaced. Since I was only after an additional 900-1000 watts added to a system which for 9 months of the year had delivered more than 100% of household requirements (to the extent that from Oct 2010 up until my last bill, I had not paid anything for electricity – just the supply charge) I decided not to go ahead with it. Further, the installer who DIDN’T come round made several unjustified assumptions. Firstly, he didn’t ask questions, just looked at his Google Earth type picture (Near Map or something) and said I had plenty of room. I queried him and told him that the “house” he was looking at was actually a side-by-side duplex with a central car port, and my neighbour already had panels installed, with excess railings on his roof, to mount more panels on. Secondly, what he (or the app) thought was usable roof space, was actually a light weight patio roof which was not suitable for mounting panels. Thirdly, what he thought was spare roof space was actually a set of non-grid connected 12 volt panels sitting on the ground, one of my first “experimental” set ups from the mid 2000’s (still working and running two freezers.) When he did decide to ask some questions, and I mentioned what was already installed he said it would probably all need to be replaced due to the compatibility issue with older equipment. Since both of my installers are now no longer available, I don’t see any point in giving their names. If they were still extant, I’d praise them to the sun. I am curious (not critical – just curious) as to why, in the context of the nature of the blog (environmentally friendly and, online, thence, computerised), and, in terms of economic accessibility, the publication is not being offered for sale, primarily, or, solely, as an “electronic” version – something like a PDF file.